Let your min pin dry completely before he plays outside. 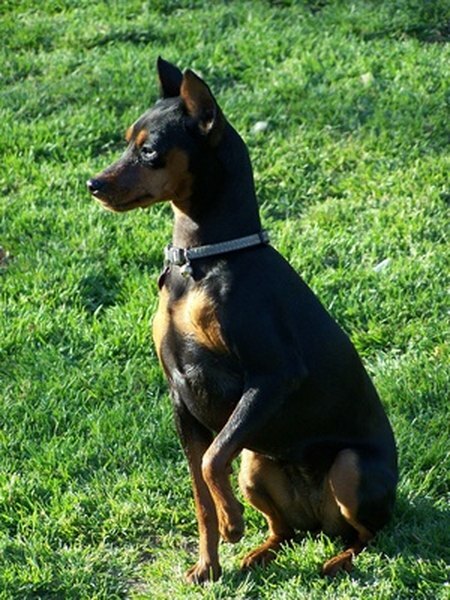 You wouldn't know it at first glance, but your mighty miniature pinscher is prone to dry skin. Of course, his short fine coat makes him susceptible to collecting dirt, dust and grime. Bathing your min pin is different from bathing other dogs, but he'll still be just as clean. Place your min pin in the sink or tub and dampen a soft clean washcloth with warm water. Unlike with other dogs, whose coats you'd need to saturate during a bath, soaking your little guy's entire coat can irritate the skin and leave him shivering. Instead, just run the damp cloth over his body and under his belly, but without massaging. Lather a dime-size amount of gentle puppy shampoo in the washcloth and gently rub it over your min pin's coat, starting at his head and working your way toward his tail. Use shampoo only if your pup is especially grimy or smelly. Rinse any soap from your min pin by gently applying clean, warm water with a washcloth. Avoid rubbing or massaging his fur, but make sure you remove any soap residue, which can cause your dog's delicate skin to become painfully itchy. Remove your little guy from the bathing area and pat him dry with a soft towel. Cold weather will leave a wet min pin shivering. Ensure that his coat is completely dry by using a blow dryer, but use the lowest possible setting and keep the dryer moving to avoid making your dog uncomfortable. Wait until his coat is completely dry before dressing your pooch in any clothing or sweaters. Trapping moisture near his tiny body creates a fertile environment for bacteria and yeast. Why Is Preening Birds Important? How Often Do Dobermans Need a Bath?